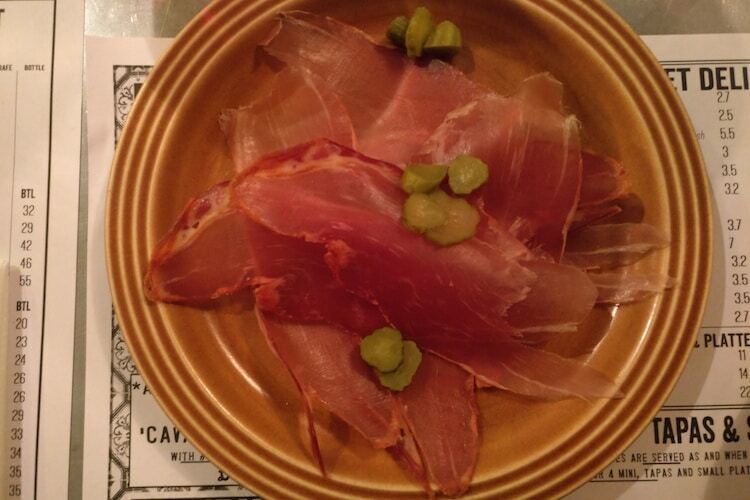 If you struggle with food related decisions, Tapas restaurants make life a little easier. Market Restaurant Hove is a tapas and small plate restaurant on Western Road in Hove that brings together English and Spanish cuisine with local produce and Spanish favourites. You can sit at the counter or at a table in its cosy Bistro style setting. 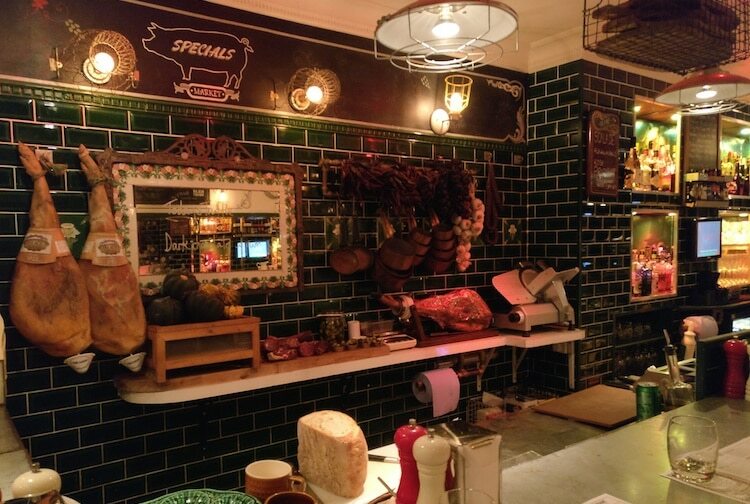 The menu offers an extensive Deli selection with artisanal meats and cheeses from Sussex and Spain, as well as a wide range of meat, fish and veg tapas and small plates. The wine selection at Market is thorough, covering Sherry, red, white, rose, sparkling and Port. 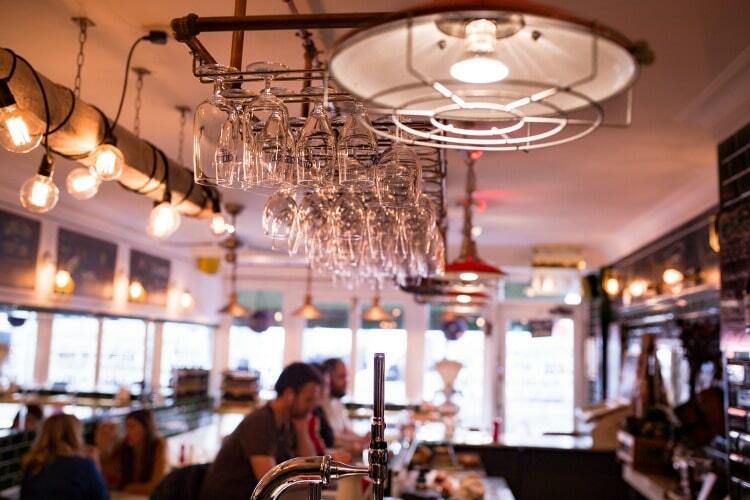 The list features many Sussex and Spanish wines; most are served by the glass or carafe, as well as the bottle. ‘Tapas on Tuesdays’ – don’t mind if I do! 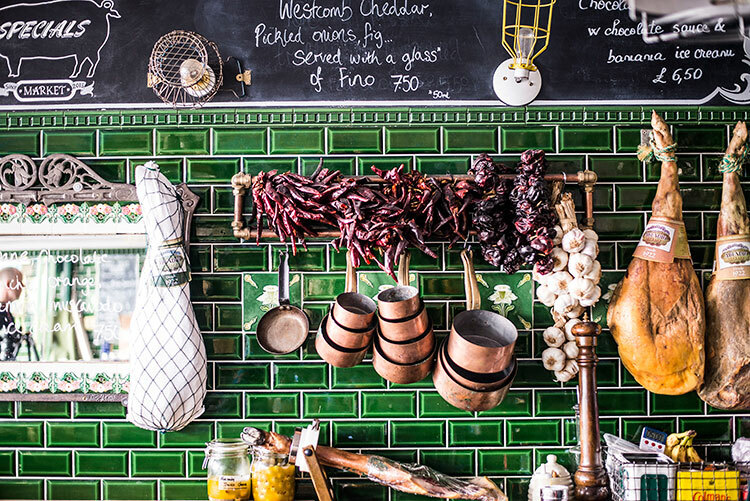 We’re sat at the counter; we’ll get to witness dishes being made from here whilst soaking up the casual European vibe. Our waiter remarks that we’re lucky, it’s ‘Tapas on Tuesday’. This means that we choose from a smaller menu, but can have ten plates for just £20 per person. It’s optional, but this is a good deal and less choice is no bad thing. Market’s Tuesday menu is separated into ‘Deli’, ‘Mini Market’, ‘Small Plates’ and ‘Baker’ (dessert) plates. We need to pick five plates each with at least one from each section. We make our choices and take recommendations on two glasses of Spanish red – the Rioja Crianza and Monastrell. Dishes come out in whatever order they are ready. As the Deli dishes only involve slicing from the joints of meat and hunks of cheese resting behind the bar, these unsurprisingly come first. There are some chopped pickles sprinkled on the Lomo (cured Spanish pork loin) and a blob of chutney on the San Simon (smoked Spanish cheese,) reminding me, it really is the simple things. 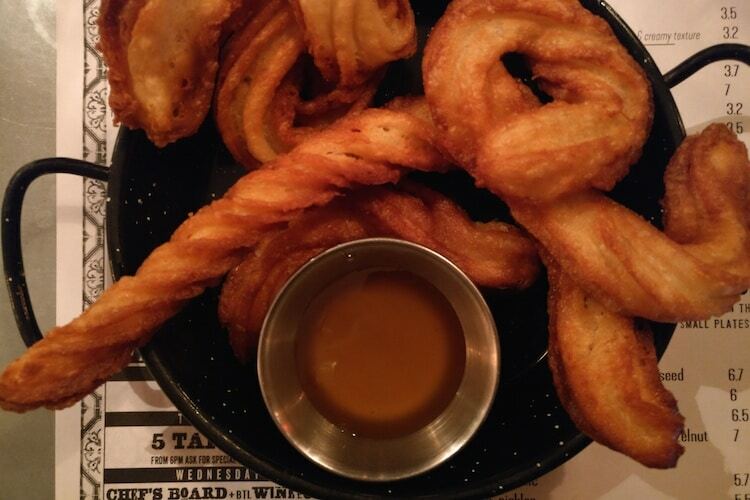 The indulgent Goat’s Cheese Churros pack a punch with a super sweet white truffle honey dipping sauce. An interesting savoury take on a classic. The sardines are delicately flavoured with lemon, a few pickles and drizzled with olive oil; all they need to be great. 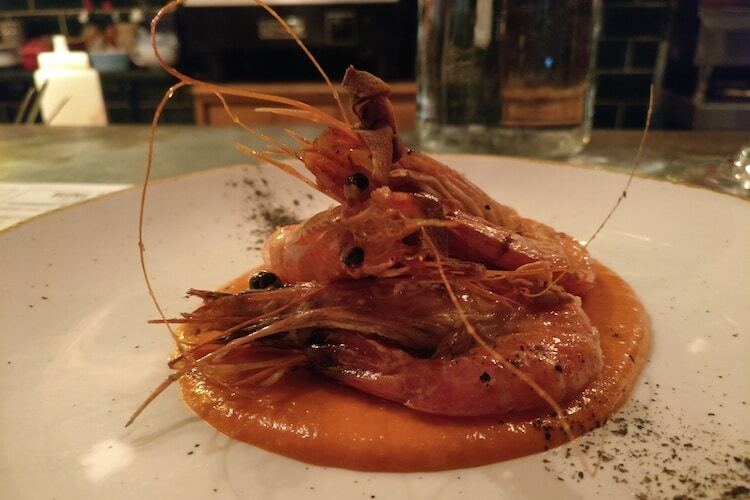 The prawns in a Mojo Rojo sauce spark a small debate between me and my husband. This is a memorable dish. The peppering of charcoal creates a flavour that is bold if a little risky; the sauce is garlicy and rich; and the prawns are cooked well. Just under half way through, we are graced with a plate of crispy olives. 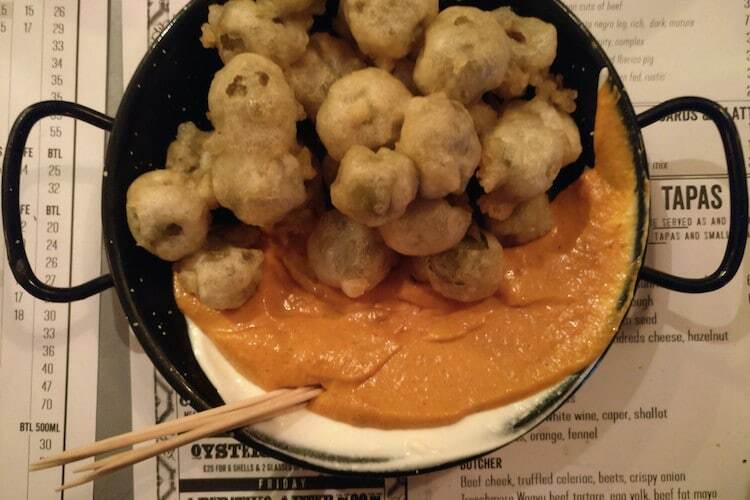 Deep fried olives to be precise, served with Romesco sauce and Greek yoghurt. Who’d have thought it? These bite-sized battered balls, combined with the creamy sauces, are super moreish. The next two dishes are game changers. 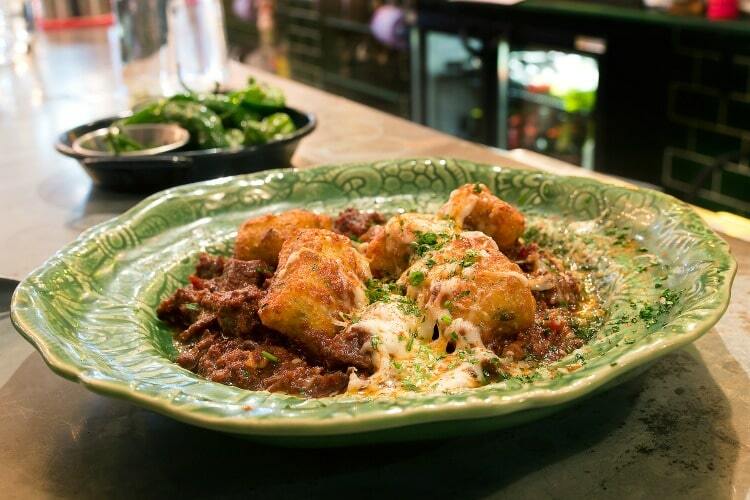 The Venison Ragu with spinach gnocchi and melted Mercia al Vino (‘Drunken Goat’ cheese made using goat’s milk and red wine) is full of strong, satisfying flavours. The gnocchi is rustic; the venison melts in the mouth. 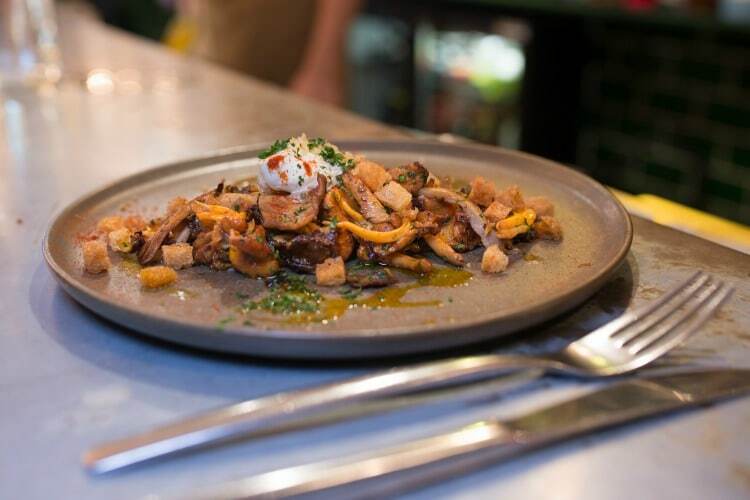 The last of the Small Plates is wild mushrooms. Visually this dish is pleasing, and it tastes delicious. The egg sauce, along with the tarragon, is savoury heaven. The owner pops out from the kitchen to talk; he tells us the sauce has been cooking all day. Market answers my ‘too full for pud’ conundrum with a yoghurt sorbet swimming in a healthy amount of Pedro Ximenez. Light, palate cleansing and alcoholic… job done. 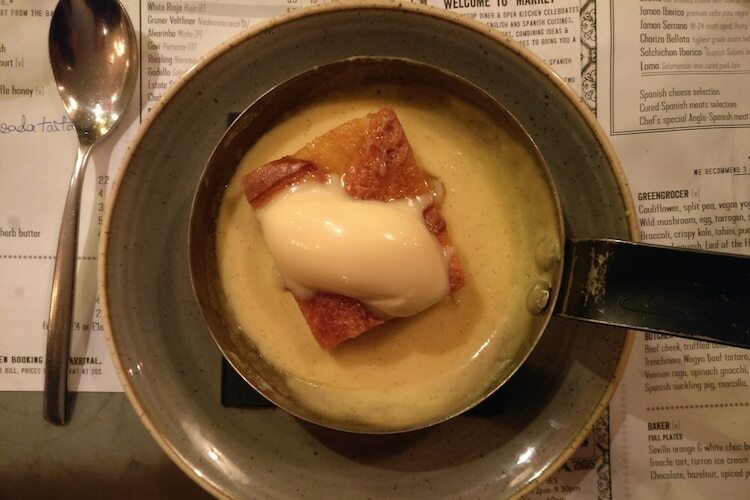 My husband’s sweet tooth and ‘second stomach for dessert’ allows him to go for the more formidable Seville orange and white chocolate bread ‘n’ butter pudding with custard. The orange flavour is subtle and there’s a good dollop of white chocolate atop the perfect buttery bread pudding. A meal at Market will span from simplicity to big flavours. The atmosphere is friendly and warm; it’d be easy to nestle in for the night. The Tuesday menu is undoubtedly good value for money, with an attractive range of dishes to choose from. 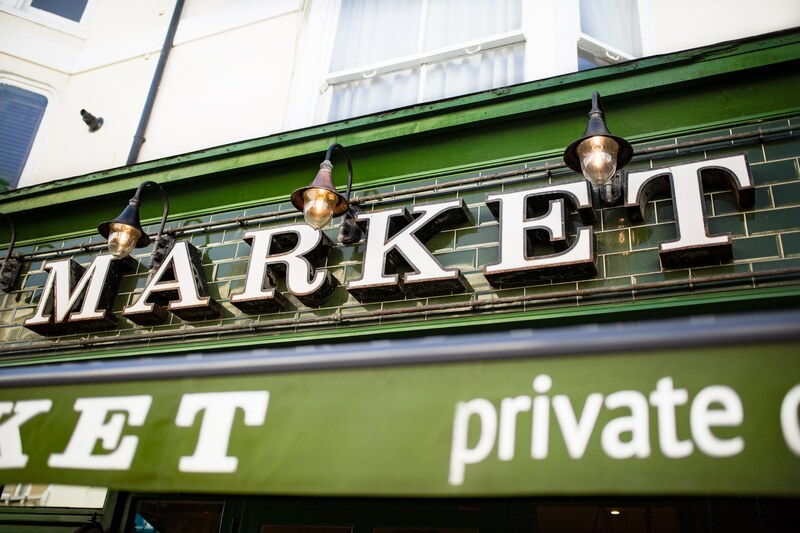 If Market is about bringing people together to share good food and wine in space reminiscent of a Spanish taverna crossed with a cosy English pub, then they’ve achieved what they set out to do. It would suit any of us sociable, indecisive, foodies very well. There’s a reason small plate dining has become so popular… who says you can’t have it all?